For families who’ve experienced a workplace fatality, serious injury or disease, the calendar may be filled with dates that spark memories: anniversaries and birthdays, dates of injury, diagnosis, court or inquest. But there is one day in the year when private memories and public memorial come together: National Day of Mourning. 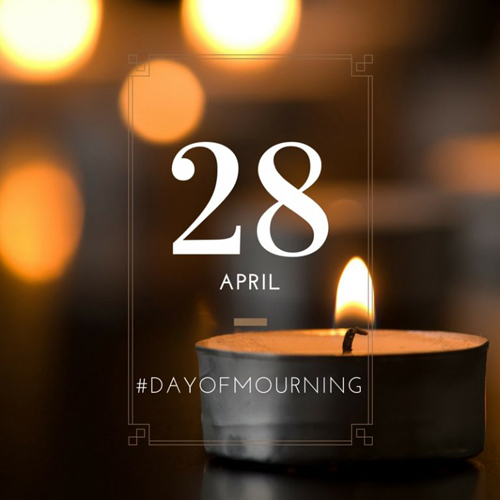 Marked on April 28 every year, Day of Mourning is a chance to honour and remember those whose lives have been forever changed by a workplace tragedy: a death, a life-altering injury or an occupational illness. Memorial events are held in workplaces and communities across Canada, and around the world. April 28 is also a chance for all of us to renew our commitment to change workplace cultures and ensure all workers return home safe and healthy, every day. Find a Day of Mourning ceremony near you, or take a minute at 11:00 a.m. on April 28 to remember, honour, and resolve. Learn more about the National Day of Mourning, April 28th and find where to participate in one of hundreds of ceremonies taking place across the country. Are you interested in writing for the Threads of Life blog? We welcome guest bloggers. Please read our blog guidelines.